With one caveat: While the number of employed people may decline in an area, that doesn't mean the unemployment rate is going up. "Where are the jobs?" is a complicated question. But there are plenty of numbers out there that provide clues. One of them is overall employment. This week, the Bureau of Labor and Statistics released new numbers showing the number of employed people in each of the country's largest 334 counties. A large county, as classified by the bureau, has an average annual employment level of 75,000 people or more. Overall, the United States gained 2.3 million jobs from December 2012 to December 2013, increasing employment by 1.8 percent to 136.1 million jobs. But in that time, a few counties stood out for above-average gains in the number of people working. The top county, Weld, Colo., saw such a large gain because of an increase in construction, with more than 1,864 jobs gained over the year. St. Clair County, Ill., which contains East St. Louis, had the largest decline in the number of people working in 2013. Beyond the counties that had the highest percentage change in 2013, the 10 largest counties in the nation each saw an increase in the number of employed people. King County, Wash., which contains Seattle, had a 3.5 percent gain in employment. The unemployment rate is still the best measure for the size of the workforce. But keeping track of the raw number of people working in different counties helps municipal governments collect and cover their tax base. These numbers come with a large caveat, however. While the number of employed people may go down in a county, that doesn't mean that the unemployment rate is going up. Older workers retire and leave the workforce. That means their departures aren't measured as part of unemployment. Even though employment numbers in three Virginia counties in the D.C. area — Fairfax, Alexandria, and Arlington — could be declining, this drop might just be attributed to older populations in those areas retiring. It makes sense, since the unemployment rate in those three counties declined while the number of employed people also declined. In Fairfax, employment fell 0.5 points to 3.7 percent; in Alexandria, it dropped 0.4 points to 3.7 percent; and in Arlington, it fell 0.5 points to 3.1 percent. "Older people who are no longer working need not be a problem if people are retiring and they're wealthy, which is most certainly the case in these counties," said Austin Nichols, a senior research associate at the Urban Institute. "That's not as much of a problem. They're still generating income; they're just not working anymore." The same goes for counties where employment is going up. That doesn't mean the unemployment rate is going down. More working-age people could move to the area and balance out the change. But this could also mean that the economy is getting better in the areas where employment numbers are rising. Just look at the top five counties for employment: Weld, Colo., saw a 1.9-point decline to 6 percent; Lee, Fla., saw a 2.3-point decline to 5.7 percent; Sonoma, Calif., saw a 1.9-point decline to 5.7 percent; Douglas, Colo., saw a 0.9-point decline to 4.7 percent; and Sarasota, Fla., saw a 2.3-point decline to 5.6 percent. It could also mean the workforce is still struggling in areas where numbers are declining. St. Claire, Ill., experienced the largest decline in employment, but also saw an increase in its unemployment rate by 0.2 points to 9.4 percent. The same went for Peoria, Ill., which saw a 1.1-point increase to 10.1 percent. Mostly, though, the numbers show that the economy is heading in the right direction. 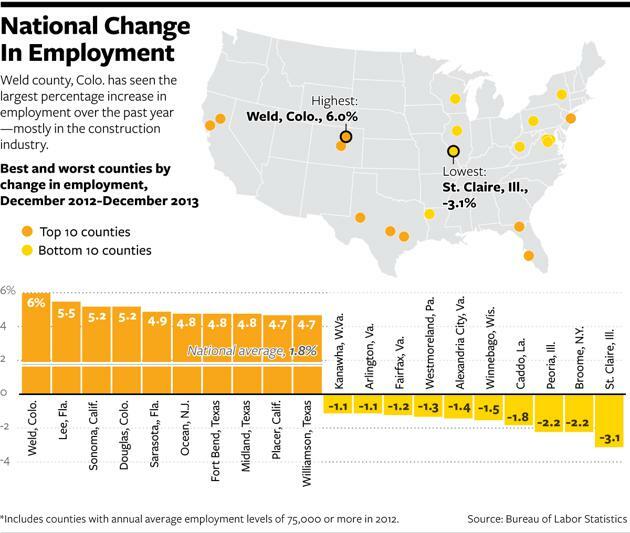 Of the 334 largest counties in the U.S., just 39 saw declining employment numbers. And this was in 2013. Judging by the declining unemployment rate, 2014 could see better numbers.